Combines the visibility of a magnetic board with the in-depth data and hands-on access of a card file! Ideal for Assembly instructions, Materials, Equipment & Tool control, Specifications, Maintenance and Purchasing, People-Job Assignments, Kanban job staging, or any of our T-Dex™ task-specific T-Card board systems, etc. Use it Anywhere you want to have instant visible card file access with in-depth deep data! 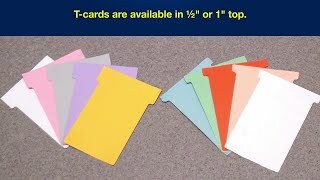 Prepare the card index style T-Cards on your PC and printer or hand post them. Use your PC to create your own special printed forms on one or both sides of the T-cards which are perforated 4-up in letter-size sheets to fit ink-jet or laser printers. T-cards are also available as individual die-cut T-Cards. The individual plastic vinyl style T-cards are for hand-posting only with damp-erase or permanent marking pens. T-Cards are 5"h x 3"w with an option of 1/2" or 1" card top height exposure. See price chart below.